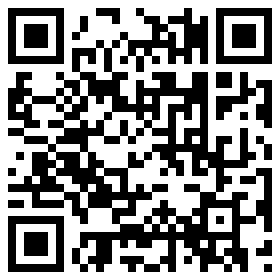 A draft version appears here: http://tinyurl.com/3hqn9e. The TinyURL for this post is http://tinyurl.com/4j9zy9. What is Twitter? According to Wikipedia, http://en.wikipedia.org/wiki/Twitter (as it appeared June 25, 2008): "Twitter is a free social networking and micro-blogging service that allows users to send "updates" (or "tweets"; text-based posts, up to 140 characters long) to the Twitter web site, via the Twitter web site, short message service (SMS), instant messaging, or a third-party application such as Twitterrific or Facebook. Updates are displayed on the user's profile page and instantly delivered to other users who have signed up to receive them. The sender can restrict delivery to those in his or her circle of friends (delivery to everyone is the default). Users can receive updates via the Twitter website, instant messaging, SMS, RSS, email or through an application." That in a nutshell is the story of Twitter. Now to fill in some details: Twitter is currently (in this present nanosecond) the most popular of the genre of 'microblogging' tools that emulate SMS messaging but fall short of blogging by whatever you can say in a blog beyond a very short text message of 140 characters (the maximum permissible length of an SMS text message when sending 8 bit data). Coincidentally this happens to be a text-length that encourages brief and succinct responses to the question, "What are you doing right now?" But if that's as far as you've got with Twitter you're a long way from fully appreciating it. In fact, as with many other milestones in our lives, Twitter's aficionados can most likely recall the moment when they 'finally got' Twitter -- and many have documented these moments in a wiki set up by Alan Levine here: http://cogdoghouse.wikispaces.com/TwitterCycle . I 'finally got' Twitter when I heard Jeff Utecht's presentation entitled “Online Professional Development,” podcast as part of the 2007 K-12 online conference: http://k12onlineconference.org/?p=205. Jeff recorded his presentation as a description of what he was doing at his computer in Shanghai while walking us through how he was using Skype and other social networking tools to connect with his professional network from there. So he was crafting his presentation as a live Skypecast, and he mentioned that he had just put a message out on Twitter inviting anyone online to Skype-in and discuss with him how they were using these tools themselves. A few minutes later, he had a bite, as someone responded to his tweet and spontaneously joined him in Skype. The presentation then became a conversation which illustrated how Jeff's network functioned in connecting him with other educators to further each other's professional development through taking advantage of such opportunities to learn from one another. That was when I decided to start using Twitter myself. As a further illustration of how Twitter contributes to the conversational aspects of professional development, as I am writing this (everything in Twitter happens 'now') there has just appeared a tweet from Cristina Costa where she points her network to some reflections on her experiences with Twitter. In her posting "Are you twittering this?" on the Pontydysgu - Bridge to Learning blog, http://www.pontydysgu.org/2008/06/are-you-twittering-this, Cris says she at first "put twitter in my have-an-account-but-not-using-it-tool shelf. And it remained there for a while until Carla Arena and the Blogging 4 Educators team spiced up my curiosity about it once again. They were twittering and I started following them. I was fascinated by the amount of relevant information, bits of personal insights and also some trivial tweets that were arriving at my desktop in a twinkling of an eye. It was fun and most times relevant. I started seeing the point of it." I think the effective part of Twitter is the immediate feedback when you have a question or comment that you need to “get out there”. You know it will be seen by your followers and may get you the precise answer within seconds. 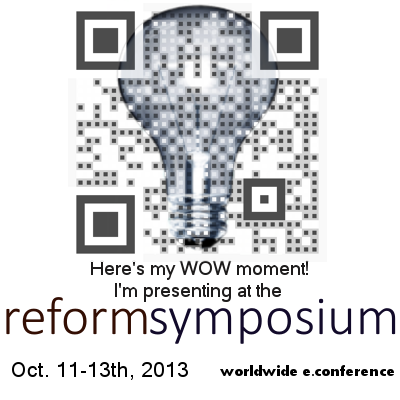 I have been able to pick up many valuable resources as well as collaborate with teachers who have similar interests. I find Twitter to be more of an interactive conversation than blogging. When I blog and get comments, it is generally just a conversation amongst a few people. On the other hand, on Twitter, the conversation group seems to be in the hundreds. I've wondered about the value of Twitter too, but I'm becoming a believer. I've picked up several things of value, not the least of which has been keeping in closer touch with the flow of thought among several close friends. I really do like the community feel of it. Well Twitter led me to your question, so it must have some value. Through Twitter I have made connections that go beyond reading and commenting on blogs. I've found new tools, jumped into presentations and conversations on UStream that I would have missed had I only heard about it after a blog post, and had some fun too. The manner in which information is shared transcends the blogosphere. The information shared is instant in access, shared on a more personal level, and often in response to a request. I do not find myself feeling connected with blog authors, on Twitter however, the unique conversation aspect creates a level of connectivity that is lacking in blogs. To 'get' Twitter, you have to have your finger on the pulse of what is pumping lifeblood through the Internet, and that is the people on it and how they come together, connect, and relate to one another in virtual learning networks (for seminal explanations of connectivism see George Siemens's reading list for his upcoming course on Connectivism and Connective Knowledge, http://ltc.umanitoba.ca:83/connectivism/?page_id=13; the course is free, and you can find out more by following gsiemens on Twitter). I threw in the word learning just now to keep this article on the topic of this journal, but in fact the concept behind Twitter is applicable to almost any kind of virtual network. When people say what they are doing right now they might be feeding the baby or doing laundry, or more interestingly, "Just landed in Bangkok, hey the wireless works." Now let's put the word learning back in, and suppose that people in your network understand that there might be a low tolerance for things vacuous, and through their postings they genuinely seek to inform and engage one another. Then the postings might be, "See Flickr photos from a tour of Jokaydia," (e.g. http://flickr.com/groups/jokaydia/) or "Webcasting live right now on the Worldbridges network, http://edtechtalk.com," or "Reading a great new article by Marc Prensky" (e.g. Young Minds, Fast Times: The Twenty-First-Century Digital Learner - How tech-obsessed iKids would improve our schools, from the June 2008 issue of Edutopia, http://www.edutopia.org/ikid-digital-learner-technology-2008; announced through 'tweets' almost the moment it appeared). Now suppose when you log on to Twitter you have a page full of postings like that staring back at you. Suppose you have cultivated a network of professional colleagues who reliably feed you URLs you might want to check out, and you've weeded out those who dwell on sagas in the laundromat. Let's further suppose that you might actually not mind hearing that someone whose writings you respect regularly goes online from the laundromat, or that someone else has an affinity for the brewer's art and intersperses a litany of pointers to interesting blog postings with mentions of tasting this or that amber fluid. One person I follow travels in west Texas on some tech-related work, the nature of which I haven't quite inferred, and tweets occasionally that he is in this bar or that restaurant, and implicitly invites anyone who is in the neighborhood to pop by and carry on the conversation over refreshments. I wonder if he gets any takers (and if so, I assume they would be like-minded people interested in the technology he blogs about), but that's not the point. What we're talking about here is just-in-time informal learning, social networking, low affective filters, a playground for knowledge workers where you can "follow" almost anyone you choose and enjoy his or her 140 character musings, often with a provocative URL to explore, from time to time, day to day, and even minute to minute. These gems of genuine interest are lodged in a matrix of emerging personalities that are themselves interesting. The result is an engaging mix of personality and professionalism, what Clive Thompson (2007) refers to in "How Twitter Creates a Social Sixth Sense" (Wired Magazine, http://www.wired.com/techbiz/media/magazine/15-07/st_thompson). One of the most compelling aspects of this kind of connectivity is the immediacy. Once a network is established then people gradually get to know one another on it. They start to converse, to respond to and support one another. If I see on Twitter that someone has just begun streaming a presentation on http://www.ustream.tv/, and if I have a moment to learn something new right then (and the most successful users of this kind of networking are able to multitask or briefly postpone whatever else they are doing in order to avail themselves of such moments) then I will check out what's happening, and I seldom regret such decisions. I'll learn a new concept or try out a new tool, or I'll make a new contact. Working in this way doors will open to other doors I didn't know existed. After a while a lot of doors are open and I begin to feel more familiar with my virtual surroundings. On the flip side, productivity can suffer if one does not appropriately balance the lure of the constant feed-stream with the discipline to address tasks requiring focus. Or does it? Perhaps heightened productivity depends on taking time for such reflection and percolation of information, ideas, and insights. My own habit of using Twitter is to bring it up over coffee each morning and review the bustle in the Twittersphere while I was asleep. I soon have multiple tabs open on my browser where I have followed the most interesting links, and I then start tagging these at http://del.icio.us/vancestevens according to my own folksonomy (an idiosonomy? ), which might in turn lead me to others who have tagged these sites as well. These links suggested by people in my distributed learning network contribute significantly to my professional development and to keeping me informed and abreast of my field. I can continue my learning by listening to podcasts in my car on my way to work in the morning, often suggested to me by people I follow in my Twitter network, and often recorded by the very people whose tweets I've been following over morning coffee. 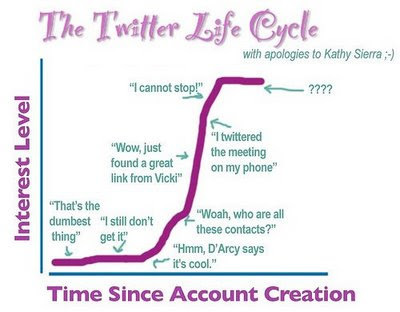 The true value of Twitter is in this network. There are other microblogging platforms such as Jaiku <http://jaiku.com/>, Pownce <http://pownce.com/>, Plurk <http://www.plurk.com/>, and even Tumblr <http://www.tumblr.com/>. Tumblr is a different kind of microblogging platform to the others, which allows users to post (or microblog) a variety of media on the fly. For more on Tumblr (from the horse's mouth) there's an interview at EdTechTalk between Paul Allison and Tumblr founder David Karp, here: http://edtechtalk.com/node/3023. Plurk is more similar in concept to Twitter, though as with Tumblr, it lets you easily incorporate media in posts. It has an intriguing interface, lets you quickly add Plurk 'fans' from your Twitter followers list, and arrays posts on a time-line where you can pull-down any given one and have conversations by postings comments. Plurk awards users Karma points for effective social networking behaviors (e.g. posting, commenting, introducing others to Plurk) which can be exchanged for enhanced features such as the right to customize a user name. There's an amusing Bubbleshare slide show presenting telltale screen shots from Twitter and Plurk which reveal the less than ideal performance of both programs, at Vicky Davis's Cool Cat Teacher blog, "A photographic journey into Plurk: See for yourself before you jump the twittership," from June 26, 2008: http://coolcatteacher.blogspot.com/2008/06/photographic-journey-into-plurk-see-for.html. Like Twitter, Plurk is blocked over public Internet in the UAE, so I often use Pownce simply because it isn't. Pownce is a microblogging platform with a pleasant interface which is also media friendly and allows more than 140 characters, but neither Plurk nor Pownce have the network that Twitter does, for me. Of course how one develops one's network, and where on prefers to do that -- whether with Twitter, Plurk, Jaiku, or Pownce (or some combination of these) -- would be particular to the individual, but there is a critical mass of participation of many users on Twitter that has driven it to the height of this genre of microblogging. It's the happening place where fusion constantly occurs. There might be several discos in town, but often there's only one that's hopping, or that has the magic, the dynamism, the appeal, and Twitter seems to have achieved the status of being where the action is (at present). Twitter is used in combination with http://jott.com to report the situation on freeways during morning commutes. Jott is a service that let's you leave a voice message using a mobile phone, which it then converts to text. Commuters phone in from their cars in traffic, the text is then posted to Twitter, and a network of followers develops to keep each other informed of up-to-the-minute traffic reports. "Twitter Saves Man From Egyptian Justice", by Michael Arrington, April 16, 2008, in Tech Crunch: http://www.techcrunch.com/2008/04/16/twitter-saves-man-from-egyptian-justice/ is about a man arrested in Egypt (for taking photographs of a demonstration) who used his cell phone to twitter from jail and thus alert his followers who managed to locate him and secure his release. http://blogs.sun.com/kevin/entry/twitterific_vs_twhirl - sic, the correct spelling is Twitterrific, with two r's). Claire Bradin-Siskin's "Resources for Twitter", http://www.pitt.edu/~cbsiskin/ling2148/twitter.html lists a couple dozen resources and articles concerning Twitter. Caroline Middlebrook's well-known "Big juicy Twitter Guide" is at http://www.caroline-middlebrook.com/blog/twitter-guide/. Crowdstatus; for example: http://crowdstatus.com/webheadsinactioncrowd.aspx - not only does this application allow you to view tweets from those in your network in one place, it also allows you to see them from behind a firewall though Twitter itself might not be working. Google Twitter Search by Steve Rubel http://www.google.com/coop/cse?cx=004053080137224009376%3Aicdh3tsqkzy is a Google-based search engine for Twitter. Tweetscan at http://tweetscan.com/, a "Real-time Twitter Search" tool, claims to be "the most complete Twitter index outside of Twitter itself," (which isn't saying much, hence the need for all these third party apps ;-). Tweetwheel http://www.tweetwheel.com/ lets you find out which of your Twitter friends know each by showing connections between them (see Gladys Baya's Tweetwheel graphic, above). Twitter presenter http://johnjohnston.name/tw/present.php enables your tweets to appear similar to PowerPoint slides. Twitscoop http://www.twitscoop.com/ creates tag clouds to show you "What's hot on Twitter right now!" 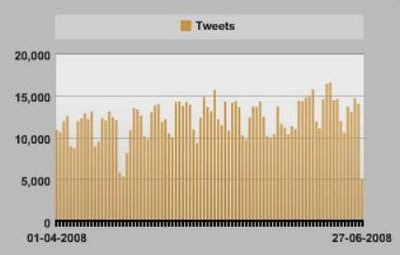 You can also generate graphics showing frequency of tweet topics over past 6 hours, 24 hours, or 6 days. class together in one place. It would also make for some really interesting inter-personal reading. Ever wondered what your class mates are doing on a Sunday evening? Check Twitter and see if they are telling you!" 3. Get a Sense of the World: Use http://twitter.com/public_timeline to gain some appreciation. 4. Track a Word: "Through Twitter you can “track” a word. This will subscribe you to any post which contains said word." 6. 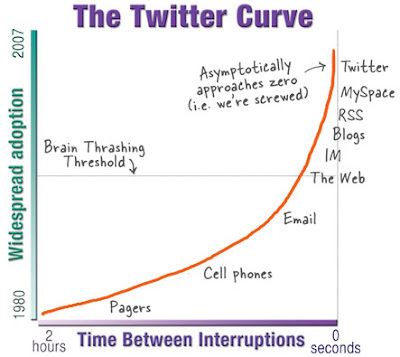 Instant Feedback: Twitter is "always on"
and ambiguity as well as of the rules it breaks. 12. Public NotePad: "good for sharing short inspirations, thoughts that just popped into your head"
13. Writing Assignments: can be based around Twitter capabilities. a writing assignment, with notable changes to classroom dynamics. Twitterlearn lets you "sign up for regular quizzes via Twitter, allowing you to test your knowledge of Spanish, Italian and German, with French coming soon. Each of the series are linked to our podcasts and the content being tested in the regular quizzes is based on the content of our podcasts. In most cases the quiz will feature a phrase or series of words to be translated into the foreign language. By clicking on the link published with each 'tweet' you will be able to check your answer on the website." Microblogging: What's on the horizon? There is one very disappointing, perhaps even fatal, flaw with Twitter, one that is seriously compromising its effectiveness as we speak, and that is its inability to scale. Google's great success was based largely on the ability of Sergei Brin and Larry Page to cobble together sufficient banks of computers that would keep their brainchild running as it not only cached the entire Internet but coped with the accelerating demands of exponentially expanding droves of appreciative users. But Google had a business model based in cleverly directed advertising that supported its maintenance of warehouses full of computers, which were farmed and expanded as needed to handle the load, whereas Twitter seems to not have the means to support its expansion. Limiting tweets to 140 characters kept it lean and simple but Twitter's database has since just this summer been overwhelmed by its burgeoning popularity. 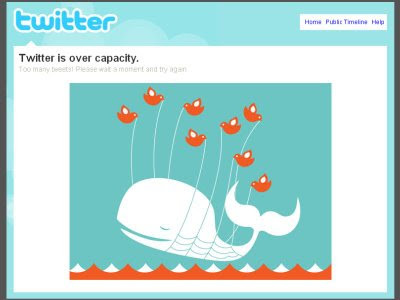 The service occasionally goes down, and whimsically displays a graphic of cherubic birds supporting a pastel whale on improbably stressed ribbons, which like Twitter itself, are perhaps a good representation of whatever it is that keeps Twitter on the air. As I've been writing this article over the past month, when the service has been working it has not often supported its "OLDER" button. When this button is grayed out you can't access the database of tweets left by your network beyond a single page. If your network comprises a hundred or more colleagues, then this one page of tweets spans only the last few hours of their twitterings. The result is the most damaging thing of all, loss of cohesion of the network. Now I no longer have access to people who normally post when I sleep at night, or during times that I am away from the computer more than a few hours. And it's not just me. Microbloggers are complaining throughout the Twittersphere about this problem, an annoyance experienced by all. Last year's NECC conference had a vibrant Twitter back channel. This year, delegates are preparing their Plan B. These problems with Twitter have been taking place just over the past month, and it is hoped that those managing Twitter will be able to revive the service and return it to its former stature. It is clear that Twitter has struck a chord among educators who enjoy and benefit from maintaining frequent symbiotic contact with so many others in their wide learning networks. As current king of the microblog mountain, Twitter has a valuable investment in its reputation for being able to reliably deliver that network on demand to its myriad loyal users. But this fan-base is slipping away as Twitter continues to frustrate those whose lifestyles and workflows now pivot so tenuously on Twitter. Although Twitter has been the tool of choice, like a trusty old car that is starting to give problems, if this tool no longer functions, people will soon opt for another. What people were actually enjoying was the new and effective way of interacting with their network. Now that the concept of microblogging through a constant interchange of SMS messages has proven so stimulating and popular, the herd could instinctively migrate to more stable pastures. Twitter could yet recover, but if not, it will not be long before another tool appears to take its place. nice and very informative blog..
Vance, this is a thorough post about twitter. Really very informative and interesting to read. I can recommend it to anyone who's considering to use twitter but isn't sure yet if it's worthwhile. Congratulations. Just to echo Joao's comment, I really like this article becuase it is so comprehensive. I think I am one of those people who just don't get Twitter but Cristina Costa is working hard on me and I am beginning to see that it may have an application as a coaching tool for our VITAE course once the participants have gone back to their home institutions. I am also about to start a 6 week course on IT and communication in late September when I shall be facing a class of young Danish IT enthusiasts and trying to get over some concepts about design, identity and ethics. I can see this as an ideal form of blogging in English at a level which may not seem too threatening for them. But first I must become more adept myself. Do you know of any research into blogs and (EFL) motivation? I'd like to do something in this area for my MA Dissertation and I need to find some sort of validated questionnaire or method for gathering data. I've been using blogs with ny students for about 2 years now so I have plenty of raw material. I really like this article- not because I saw my photo at the end, but the way you incorporated the graphs by Kathy Sierra (I like the one where she pointed out where we could actually get screwed in this cycle), links, etc. and still sound academic. Right, academically insane. So who needs twitter? I'll be teaching Internet English next semester- will see if EFL students can dig twitter. thanks for ideas about using twitter to teach languages!